Israel has won the title of "most outstanding stand" in all categories at the world's biggest tourism fair – ITB – which took place in Berlin last week, the Tourism Ministry announced Sunday. The stand was set up and operated by the ministry. This is the third time in a row that the Israeli stand wins the title of "best presenter" in the Near East and Middle East. This year, 11,000 presenters from 180 countries took part in the fair, and the prize for the most outstanding stand in all categories was given out for the first time. The Israeli stand at ITB measures 770 square meters in size and included presentations of 41 companies from Israel's tourism industry – including hotels, travel agents, airlines, tourism associations and authorities. 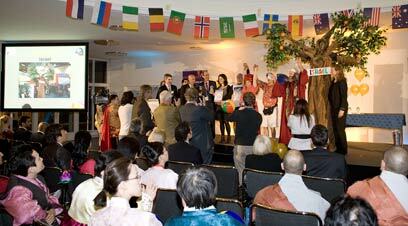 The presenters displayed to the audience the options for visiting and vacationing in Israel. In addition, the stand included a "time elevator" in which one could watch a film depicting Israel's history using digital glasses, an auction of tourism products from Israel hosted by a famous German broadcaster and a street theater show. During the fair, Tourism Ministry representatives – led by Tourism Minister Stas Misezhnikov – worked to tighten relations with the German tourism industry, create new work relations and examine options for cooperation. The tourism minister met with the CEO of the TUI Germany travel group, who informed Misezhniko of the plan to expand the activity of the Air Berlin airline on the Berlin-Tel Aviv route as of mid April. The minister also met with the chairman of the German Parliament's tourism committee, and the two discussed ways to expand the cooperation between the countries in terms of medical tourism. The sides also agreed that the committee would hold one of its official meetings in Israel in the coming days, as part of a round of countries which are of great interest to the German committee. "The title won by the Israeli stand gives Israel's tourism industry a lot of respect and prestige, which were expressed during the fair with a great amount of activity and interest, both on the part of the professional elements and on the part of potential tourists," Misezhnikov noted. "The Tourism Ministry will invest tens of millions of shekels in the coming months in translating this trust into implementing Israel's touristic potential and increasing incoming tourism." 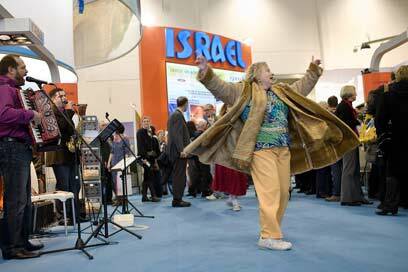 See all talkbacks "Israel wins 1st place in Berlin tourism fair "